Apfelkrapfen is often considered a Bavarian delicacy, but they're not reserved for special occasions. They're commonly made at home. Slice the apples in the round, cover them with a batter and deep fat fry them for some instant comfort food. This batter has egg whites providing the airiness, but yeast dough and puff pastry versions are also known. Peel and core the apples. Slice 1/4 inch thick or a little thinner. Brush with lemon juice. In a separate bowl, stir together the egg yolks, flour, milk, sugar, and salt until a thick batter forms. Add more milk or flour as necessary. Stir 1/3 of the stiff egg whites into the batter to loosen. Carefully fold in the rest of the egg whites for a light, fluffy, but not runny, batter. Heat 2 - 3 cups of oil in a large saucepan. (Learn about deep fat frying here) Heat the oil to 350°F (190°C). Heat 3 - 4 inches of oil in a large pan to 350°F. Check the temperature with a frying thermometer or test it by throwing in a 1-inch cube of bread. If it browns (but doesn't burn) in 60 seconds, your oil is about 365°F. Alternatively, get out your deep fat fryer and follow the directions. 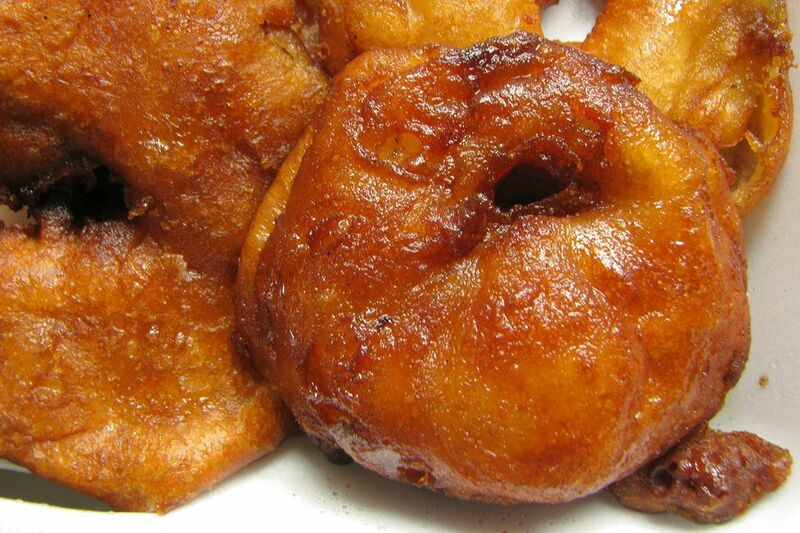 Drain the apple rings as necessary and coat them with some flour, then dip them in the batter with a fork. Place them carefully in the hot oil and fry for 3 to 4 minutes. Turn them over and fry for 3 minutes, or until golden brown. You may wish to keep them warm in a warm oven until they are all baked. Served soon after by sprinkling with sugar and cinnamon or vanilla sauce or both.